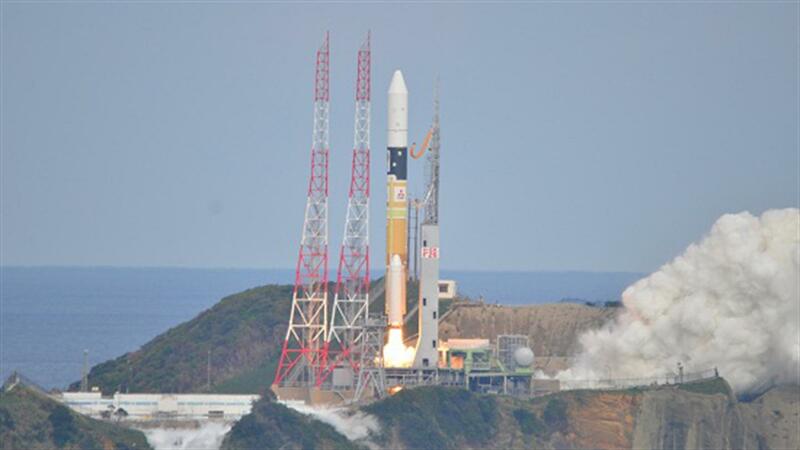 On 3 December 2014 at 05:22 CEST, an H IIA launch vehicle lifted off from the Tanegashima Space Center and the Japanese Hayabusa2 spacecraft and its MASCOT lander, developed by DLR, began their journey to Asteroid 1999 JU3. On 3 December 2014 the Hayabusa2 spacecraft and its MASCOT lander began their journey to asteroid Ryugu. The Japanese Hayabusa2 spacecraft with the German-French Mobile Asteroid Surface Scout (MASCOT) lander on board has completed its 3200-million-kilometre journey to asteroid Ryugu. 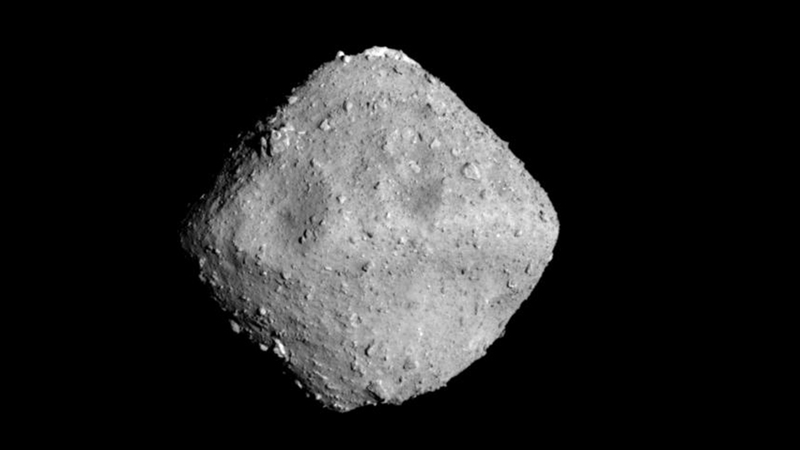 On 26 June 2018, the Japanese Optical Navigation Camera – Telescopic (ONC-T) on board Hayabusa2 imaged the asteroid Ryugu from a distance of approximately 22 kilometres, shortly before it arrived. The ONC was developed and built under the leadership of JAXA in collaboration with the University of Tokyo, Kochi University, Rikkyo University, Nagoya University, Chiba Institute of Technology, Meiji University, Aizu University and the National Institute of Advanced Industrial Science and Technology (AIST) with contracted contributions from the company NEC. Credit: JAXA, University of Tokyo, Kochi University, Rikkyo University, Nagoya University, Chiba Institute of Technology, Meiji University, Aizu University, AIST. 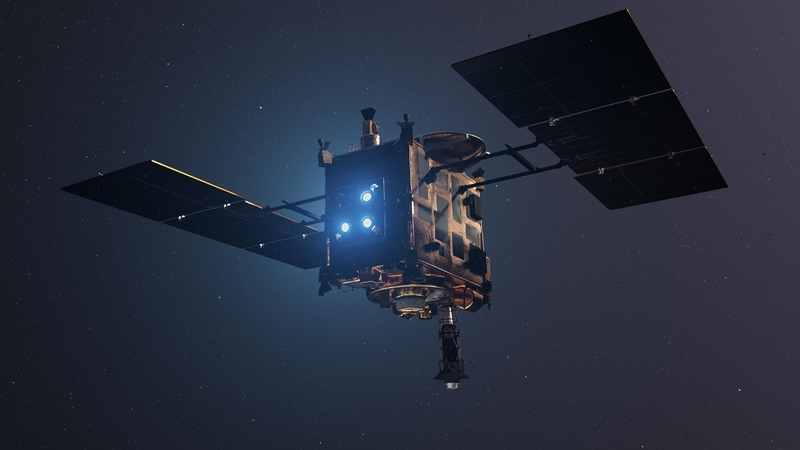 The Japanese Hayabusa2 space probe has completed a 3200-million-kilometre long journey carrying the German-French lander MASCOT (Mobile Asteroid Surface Scout). 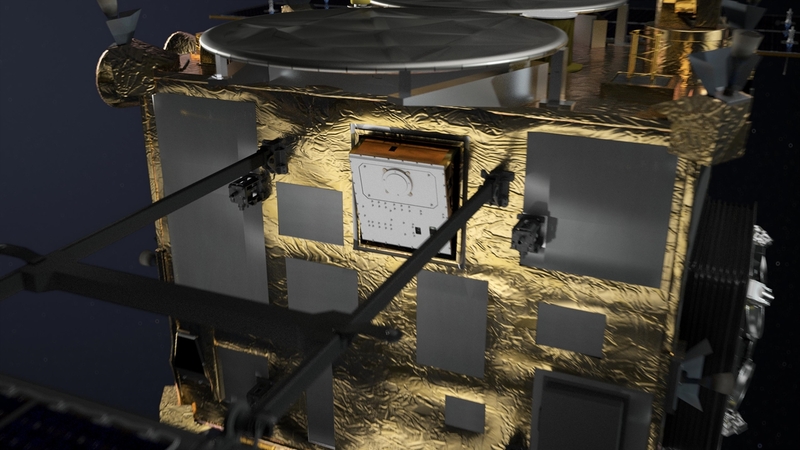 A total of four instruments are installed within the 30 x 30 x 20-centimetre lander. A DLR radiometer and camera, together with a spectrometer from the Institut d'Astrophysique Spatiale and a magnetometer from the TU Braunschweig, are set to examine the mineralogical and geological composition of the asteroid’s surface and gauge its surface temperature as well as the asteroid’s magnetic field. A built-in swing arm gives MASCOT the required propulsion to make jumping manoeuvres over the surface. On 3 December 2014, the Japanese space probe Hayabusa2 embarked on a sample return mission to the C-type asteroid (162173) Ryugu (formerly designated 1999 JU3). It is operated by the Japan Aerospace Exploration Agency (JAXA) and carried the MASCOT (Mobile Asteroid Surface Scout) lander built by the German Aerospace Center (DLR) in collaboration with the French Space Agency (CNES) and the Japanese space agency (JAXA). Hayabusa2 is the immediate follow-on mission of the Hayabusa mission, which saw the first probe return to Earth with samples taken from asteroid Itokawa in June 2010. At that time, the DLR Institute of Planetary Research also investigated the rare particles. The aim of the Hayabusa2 mission is to learn more about the origin and evolution of the Solar System. Like comets, asteroids are some of the most primordial celestial bodies. Researching asteroids gives us a glimpse into our cosmic past. Near-Earth Objects (NEOs), such as Ryugu, also pose a potential threat to Earth and therefore need to be investigated to learn about and reduce their threat. returning samples of the asteroid to Earth. Hayabusa2 and MASCOT worked together as a team: Hayabusa2 provided the necessary data so that a suitable landing place could be found for MASCOT, whereas MASCOT carried out experiments on the asteroid's surface and provided data on materials and the surrounding area to find a location to gather soil samples. For this, Hayabusa2 will lightly touch the asteroid's surface in order to gather material, which it will then bring back to Earth. The low gravitational force of the asteroid, which amounts to just one 60,000th of the gravitational force on Earth, presented a challenge for the mission. This force is insufficient to 'pull' the lander out of the Hayabusa probe. 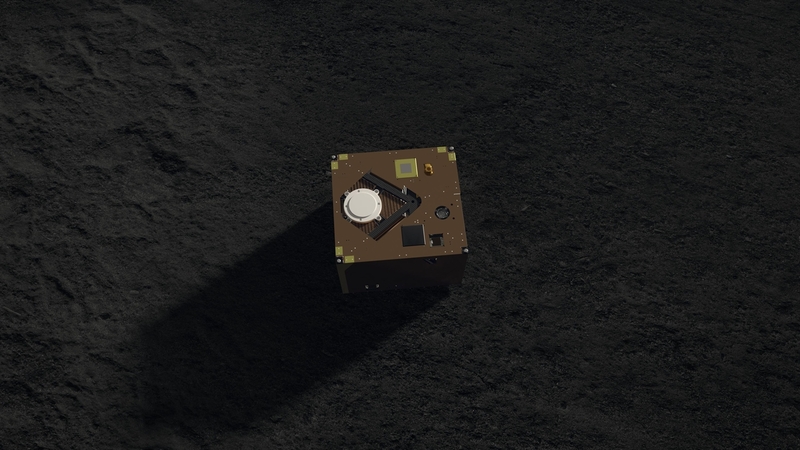 As such, MASCOT was pushed out of its holder by a spring mechanism and fell to Ryugu from a height of approximately 60 metres. Had this happened too quickly, then MASCOT could have bounced off the asteroid's surface. The lander's 'hopping' on the asteroid from site to site was programmed from start to finish so that it did not reach escape velocity. The escape velocity from Ryugu is calculated to be 38 centimetres per second. By way of comparison, the escape velocity from Earth is 11.2 kilometres per second, and that from the Moon is 2.3 kilometres per second. The mineralogical and geological composition of the asteroid’s surface and its surface temperature and magnetic field were investigated with a radiometer and a camera developed by DLR, as well as a spectrometer of the Institut d'Astrophysique Spatiale and a magnetometer by TU Braunschweig. The duo reached Ryugu on 27 June 2018. On 3 October 2018 at 03:58 (CEST) MASCOT separated from the Japanese Hayabusa2 spacecraft, and landed and made contact wit Ryugu approximately 20 minutes later. MASCOT was operational for over 17 hours, during which it collected data from the asteroid's surface. Hayabusa2 will return samples to Earth in 2020. The DLR Institute of Space Systems, based in Bremen, together with CNES (Centre national d'études spatiales), designed, manufactured and tested the lander in the Institute's laboratories under space conditions, for example on a shaker, in the thermal vacuum chamber and during parabolic flights in the drop tower at the Centre of Applied Space Technology and Microgravity (ZARM). The DLR Institute of Composite Structures and Adaptive Systems in Braunschweig was responsible for the lander's stable structure. The DLR Robotics and Mechatronics Center in Oberpfaffenhofen developed the arm that allows MASCOT to ‘hop’ on the asteroid. The DLR Institute of Planetary Research in Berlin contributed to the MASCAM camera and the MARA radiometer. The MASCOT lander will be monitored and operated from the DLR control centre at the Microgravity User Support Center (MUSC) in Cologne. 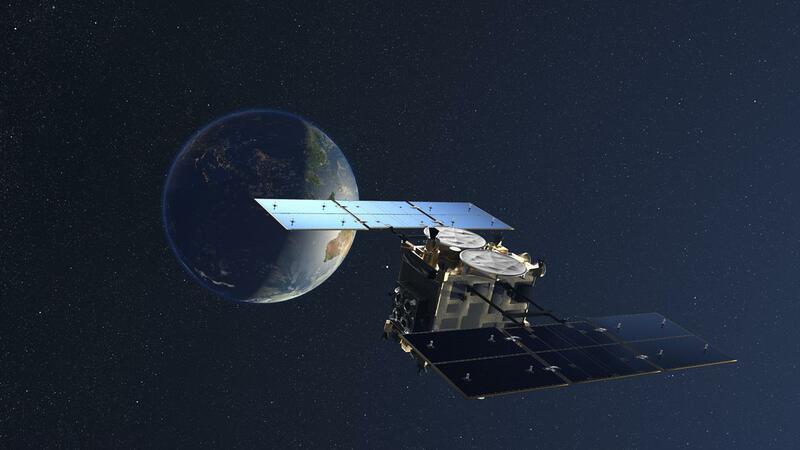 CNES contributed the power subsystem to MASCOT, as well as a part of the telecommunications system, which included the development of antennas, and the agency will assume responsibility for the descent and landing mission analyses.